Excerpt from "Beyond the Circle"
The early history of Aitkin County centers around the Native American people. The tribes that lived in the area many centuries ago are not known. There may have been many different groups who occupied and laid claim to what is now Aitkin County. What we do know is that by the time the first Europeans came to America, Aitkin County was in the hands of the Dakota or Sioux Indians. However, by 1780 or so, the Ojibway bands had wrested control of this territory from the Sioux. The Haypoint area was a valuable location simply because of its geographic position. It was directly on the north-south path where early tribes would travel on their way from Walukanabo Lake to Pokegama Lake to the north. Through a series of portages and by using the Willow River and other waterways, the Indians could travel with relative ease. It was a much more direct route than just using the various rivers, and they would not have to battle the upstream currents as much. In 1868, government surveyors noted a group of one hundred fifty Indians gathered at Haypoint. They had harvested wild rice from the numerous rice fields that grew in great abundance there. The Indians also had a cemetery located there which was still in existence when the first white settlers came. The surveyors also noted that both the Willow and the Moose Rivers were good driving streams for logging. The Haypoint area became the center of activity during the logging era. 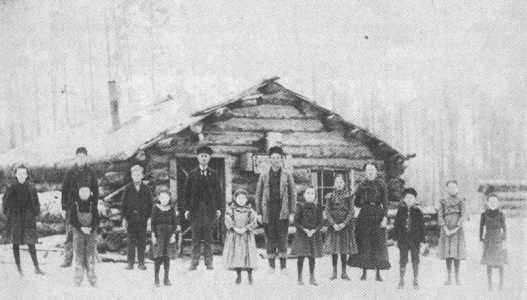 Perhaps the first major logger was a man by the name of Morrison, who had a camp on the Willow River near Big Rice Lake in Cass County in 1871. Other loggers soon followed. 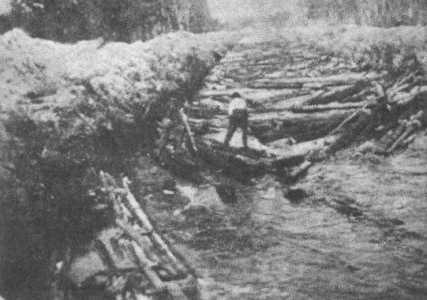 Fred Blais did some logging on the Moose River around the turn of the century. His knowledge of the region may have spurred him on to settle in the Shovel Lake area. 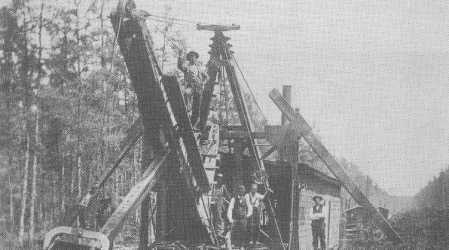 By 1910, the log drives were nearly over. There were a few more that went down the dredged Willow River and then that era closed. Most historical accounts credit Joshua Tibbets as the first white settler in the Haypoint area. 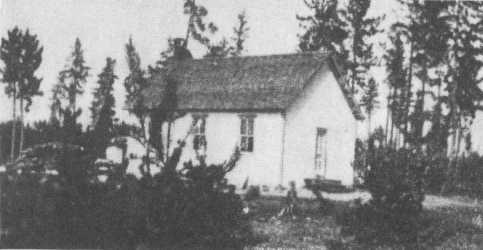 He is said to have moved to his homestead in 1872. He recorded a deed for his land at the Aitkin County Courthouse on October 15, 1875. The homestead certificate was signed by Ulysses S. Grant, then President of the United States. The Aitkin Republican Newspaper notes the difficulty of travel in those days for Mr. Tibbets. "Joshua Tibbets, another member of the pioneer family, conducted a ranch on the Big Willow near Swatara. It was a three days trip to this point from Aitkin aboard 'Wanigans', the current mode of travel. The Mississippi was at that time the one great highway of the county." (Aitkin Republican--October 10, 1929). 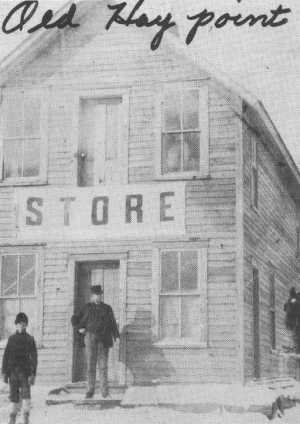 Other homesteaders came to the area around the turn of the century. They came from various parts of the country and state. Real estate firms promoted the area as one that readily supported farming and was full of opportunity. One such firm was the Willow River Land Company whose owners were Edwin L. Buck and Marcus P. Hobart. They had a financing plan that favored the farmer and were one of the ways settlers learned of the area. The brochures they sent out commented about Haypoint as follows: "Haypoint drew its name from its close proximity to the vast meadows of re top and blue joint grasses nearby on the Moose, Hill and Willow Rivers, three beautiful streams, which cross (our) 6,000 acres....These meadows...yield 20,000 tons of finest hay per year, but as yet much of this fine grass is not cut ever year...."
Some of the early families to settle in the Haypoint area were: Tibbets, McPheeter, McAnnich, Armstrong, Johnson, Washburn, Biskey, Baldwin, Foust, Pilgrim, Harrington, Woodruff, Baty, Lamke, Wynkoop, and others. The George McPheeters family were already living in Haypoint in 1898. The O.O. McAnnich, Armstrong, and Ed Johnson families came to Haypoint in 1899. In 1901, Mr. and Mrs. William Washburn and son Willie came to live here. John Biskey came in 1906, as did the Harry Baldwin family. Bert and Lucy Foust came in 1910. About this same time, John Pilgrim and Frank Harrington moved in. Soon after a wave of immigrants came, and the area settled quickly. Haypoint established its own post office in July of 1900, with Oliver McAnnich as the first postmaster. The post office continued until 1919 with George McFeeters as the last postmaster of Haypoint. Ira McAnnich arried mail from Aitkin to Haypoint by traveling along the old tote roads of that day. Fred Hersum then carried mail to Haypoint from Hill City once a week followed by M. W. Sawdey and Emil Foix. 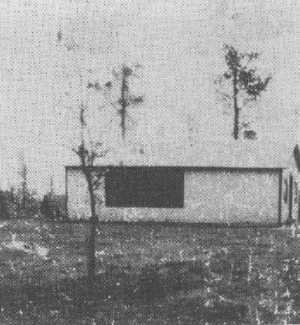 A school was built at Haypoint across the highway from the cemetery. This was in 1900 with Jonathon J. Gildersleeve as the first teacher. A second school was built at Haypoint in 1906. The school had its own district (known as District 39) until 1921, when it then merged with Swatara. Another school was located in the north end of the township and was called the Willow River or Jewett School. This school was open from about 1913 until 1933. The Jewett School burned in the spring of 1925 when it caught fire from a brush fire that raged throught the area. It was rebuilt by E. J. Naylor for a cost of $1, 475.00. To the east of Haypoint was the Lamke or Baldwin School. 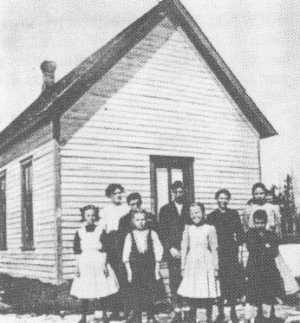 School was first held in the homes and later in a log building and eventually in a frame school house near the Lamke homestead. The people decided that they needed a local form of government to take care of needs such as roads, bridges and other concerns, and so a township government was formed. MacVille was selected as the name for the township because, at the time, there were so many "Macs" around. This of course referred to the McPheeter and McAnnich families. 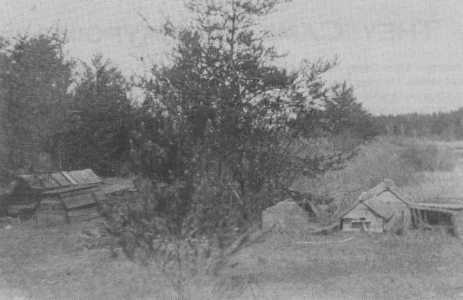 The township was organized in 1901. The township established a cemetery in 1919. 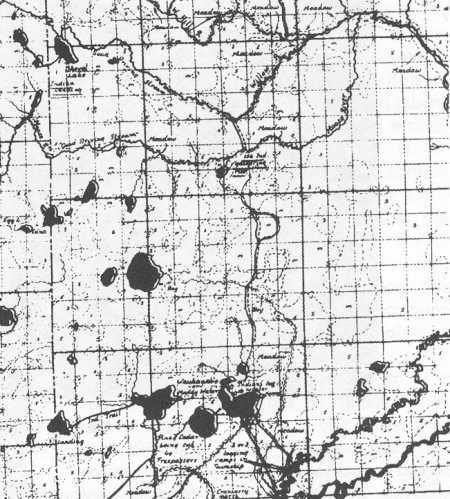 The major event came in 1910, when Aitkin County decided to drain its lowland areas. It was felt that the Haypoint area lent itself well to the concept of drainage. Wetlands held little value to the early settlers. They were desirous of obtainig good land for farming purposes. The benefits of dredging were believed to be quite large. The estimated benefits are $176,301.46 and the damages $4,000.00 and 68,000 acres of land will be affected. The project embraces three main ditches, with several laterals, and the length of all combined will be about thirty miles, and the approximate cost will be $60,000.00. And so the dredges came. The three big (steam) dredges operated by the Kohler Construction Company were working day and night. The company had been awarded the contract to build forty-two miles of state ditch draining the natural meadows southeast of Hill City. Art Wynkoop was the crew foreman who worked the dredges around Haypoint. They started just west of Haypoint and worked their way downstream along the Willow Eiver, digging lateral ditches as needed. The idea was to use the natural flow of water to help push the dredges along and wash any loose mud downstream. The Willow River was channeled and placed in a near easterly direction cutting off a large northeasterly loop that readily flooded and kept the land wet. One dredge was left in the woods south of Rabey. Why it was left there no one seems to know. 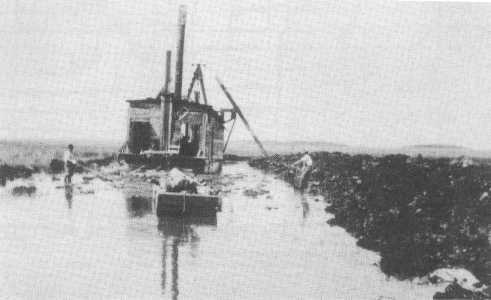 The main dredge worked its way to the Mississippi River where it broke through the natural levee and into the main river. Several men from Haypoint worked for the operation, and they lived and ate on the wanigans that followed the dredge. The crew could cover about 100 feet a day or 300 feet when they went through bogs where the dredging was easy. A dam was built at Shovel Lake during this time for water control. The water backed up there may have been used by Fred Blais to help sluice his logs down the newly dredged Willow River. Note how the river was straightened by the dredges. In 1929, the new Highway 169 was built from Aitkin to Hill City. This changed a lot of things for the area. The old Highway 35 had run through Swatara and on to Hill City. Now it ran through Haypoint. Frank Hutze moved his building to Haypoint in the early thirties and started the Corner Store. "Clifford Gravell owned the store from 1936-40. After a couple of owners, my cousin, Jack Jamme bought the store. He was there from about 1941 to 1954 with his son. We (Rick and Beth Jamme) then bought the place and ran it until 1960. While we owned it, we had groceries, gas, and 3.2 beer. Beth Rice, Lyle Wagner, James Stone and other people owned the place after that, and it is now run by Herb Stansbury." Others followed suit. 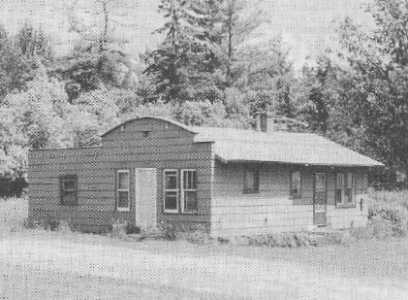 Henry and Gertrude Hayes built a tavern just south of Haypoint on the new highway. One could take advantage of the new traffic volume, and so the Hayes set up shop in the early thirties. The Hayes stayed until 1964, when they sold their place to Mr. and Mrs. Mervin Fossen. In the mid forties, Ed and Jack Jamme built an auto repair garage on the northwest corner of Highway 169 and the Swatara Road, across from the Corner Store. They sold it to Harlow Hendershott in 1946. There was room in the garage for several cars. Harlow ran the business for a few years, and then sold it to some deer hunters. It eventually burned down. Art Peterson used to have a hardware store at Haypoint. He had a cement block plant there where he made and sold cement blocks. In 1963, Glen Hoppenrath bought Art's place and started the Willow Inn. It was located at the northeast corner at Haypoint. He had food, beer and gas there until 1968. He then sold the place to Warren and Helen Allen. They ran the tavern and had liquor, beer and were noted as having excellent food. They sold out in 1974 and shortly after, the place burned down. About 1968, snowmobiling had become a great sport. The problem for many was they didn't have anywhere to ride their machines. 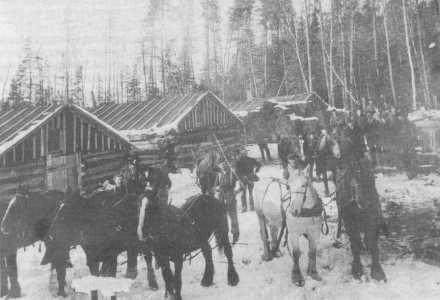 The Haypoint Jackpine Savages Snowmobile Club was formed, and a trail was constructed to Hill City. Over the years several more miles were added to the club's trail system, and many sledders have enjoyed this popular sport on the trails. Time marched on, but who could forget swimming at the Moose River Pool. Many dances have been held at the Corner Club, which grew out of the Corner Store. A wide variety of orchestras and bands have played there over the years. A softball field was built behind the club where a lot of fun games were played. Haypoint continues to thrive and the people are well known for their hospitality. That's why they came to Haypoint. Swimming at Moose River Pool was always a popular sport for the children.